Senior August “Mustang” Sally is selected as Wendy’s High School Heisman school winner for Denver East High School. 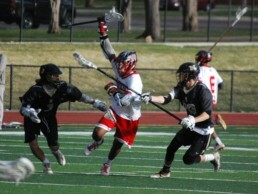 Sally is a four year Varsity Attack on the Denver East Boys Lacrosse team, and a recognized role model in the Denver community. State Winners will be announced November 7, 2018. The Wendy’s High School Heisman is a prestigious annual award with awards offered at the State and National levels. Eligibility begins with maintaining a GPA of 3.0 (B average) or better. Applicants also need to be proven leaders and role models within their school and community. And applicants must perform in at least one of the 47 school sponsored sports recognized by the International Olympic Committee in the Summer and Winter Olympic Games or the National Federation of State High School Associations.